Jacques Tourneur’s “Berlin Express” takes place post in post-WWII Europe, where even if the war was over, uneasiness nonetheless remained, evoked in an opening that transitions from an idyllic, almost travelogue-ish narration of the sights and sounds of Europe with an ominous note tied to a dead pigeon. “The dove of peace was a pigeon,” grouses the narrator, “a dead pigeon.” That fits the mood, one enhanced by the film’s on-location techniques, so prevalent in the 1940s in all manner of countries, including Germany, though the country’s famed “rubble films” are not ones I have caught up with. As an opening title card makes clear, “Berlin Express” was filmed in Germany, particularly Frankfurt, with cooperation of the occupying authorities. And in an era where information was not passed along so quickly along the information super highway, to see the true after-effects of a brutal, lengthy war on the big screen must have been a potent image, and they still retain their brutal majesty, even in small-screen, a terribly evocative reminder of what happens when war comes home. 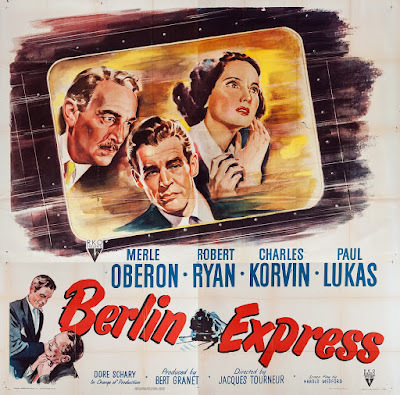 Indeed, these early moments of “Berlin Express” suggest something akin to a docudrama, like Rossellini’s “Rome, Open City.” And while Tourneur’s previous film, “Out of the Past”, the greatest noir, was straight drama, it was a movie very much about mood. But if “Berlin Express” seems readymade to roll with the mood its locations engender, the narrative fails to conform, hitched not to one ruing what was or what is nor any kind of fatalistic future. Instead it takes its cue from a German professor (Paul Lukas) seeking to bring about unity to a country divided up into differing zones, not wallowing in what was but dreaming of what could be, of how all this rubble presents the opportunity for rebirth, somewhat dimming the harshness of the after-effects that Tourneur’s camera records. Still, that dark hearts committed to unrest continue to lurk about the German capital goes without saying, and the plot’s impetus is the professor’s apparent murder aboard a Berlin-bound train, causing it to be halted and the passengers interrogated. Myriad twists abound, none of which have much juice, nor do the set pieces, aside from the final dying moments of a vaudeville clown amidst a crowd that doesn’t notice at first what exactly is happening, which might not necessarily feel apiece of the narrative parlor game but achieves a morbidly comic profundity anyway. The characters in “Berlin Express” are deliberately of different nationalities, all of whom eventually must set aside their inherent distrust to work together, fueling the promise of a better tomorrow, a new global order, a world without borders, which sounds, to my admittedly modern eyes, pretty appealing. These potentially pertinent themes, alas, never really get tied into the screenplay. The villains, meanwhile, feel surprisingly feckless considering they are supposed to represent the last of the Nazi scourge, and the guns blazing conclusion is a pat case of Saved Just In The Nick Of Time, the script unable to find a more natural, convincing way to get its character out of a jam. Even if the movie wants to leave you with some sort of hope for the future, well, these plot developments never quite seem to mingle with the air evinced by the locations, leaving the whole thing feeling aloof and confused. Maybe that’s how Germany really felt back then.